Beginning in year 2019 the Blue River Wilderness Retreat will no longer have trailers to rent. We will be replacing the trailers with another cabin. Check this website for new photos when this second cabin it ready to rent. 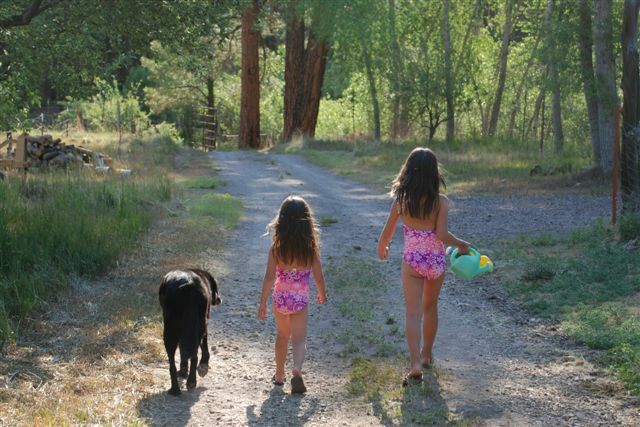 The Retreat resides on 12.5 acres of the lower end of an original 48-acre homestead that is completely surrounded by national forest. There are two streams that flow through the property – Dry Blue Creek and Frieborn Creek. Dry Blue runs all year and just below their property the Campbell Blue and the Dry Blue flow together to form the Blue River. The retreat is situated in a riparian area that contains walnut, cottonwood, ponderosa pine, alder, willow, and juniper. Our guest cabin faces Frieborn Creek and Dry Blue Creek. Guests can enjoy the sound of the flowing river and a star filled night sky. At an elevation of 6,400 feet our summer temperatures provide a pleasant relief from the desert heat. Summer temperatures range from daytime highs in the low 80’s to nighttime lows in the 40’s. News for 2019: Beginning in year 2019 the Blue River Wilderness Retreat will no longer have trailers to rent. We will be replacing the trailers with another cabin. Check this website for new photos when this second cabin is built and ready to rent. Don and Janie Hoffman moved to the Blue River on the Arizona/New Mexico border in 1977. 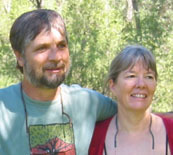 Don had a career with the U.S. Forest Service as a Wilderness and Trails Specialist and Jane works as a studio artist and art teacher. Over the years they have built their home, kept a variety of animals, planted an orchard and gardens and raised their two children. In 1988 they moved out of their cabin into a two story home that they built themselves using post and beam mortise and tenon joinery. The cabin soon became a guesthouse, which they rented to artists as a summer retreat. In 2001 Don retired from the Forest Service and started a new career as Executive Director of the Arizona Wilderness Coalition. Don and Janie soon started hatching their dream of expanding their guest accommodations to provide a retreat for individuals, family reunions and groups who want to enjoy the incredible environment on the Blue River. The Blue River Wilderness Retreat is the realization of this dream.